Description Use your mind and careful planning to solve various 3D picross/nonogram puzzle and uncover many interesting shapes that hidden within! Click on the block that have 0 number on their side to remove them. Watch and analyze various block with different number to discover pattern and predict the block that can be removed. The number on the side of a block show how many block that part of the shape and can't be removed on that direction. 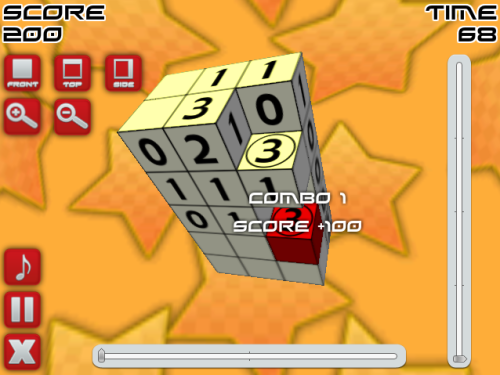 Player can also rotate the 3D puzzle, and use horizontal/vertical slider to see the inside of the puzzle. Each removed block will increase combo, and combined with game time, it will decide player rating for that level. You must reach the highest score with the lowest amount of time to reach 3-star rating!